Deep inside me there’s a Gypsy soul with a lifelong desire to experience the Traveler’s Rush by wandering the universe; by way of neighborhoods, by states, and by countries. Most recently the Travelers Rush came by way of airplane travel to Scottsdale Arizona, from my home state of Oregon; for 5 marvelous days. To suggest that I am a seasoned traveler would give a false impression. Despite my personal quest to see the world, what little I have seen has mainly been from inside a vehicle on road trips. I am a devoted fan of road trips, but given my car is almost 20 years old, and I a bit older with my own wear and tear flying makes the most logical and logistical sense. I cannot argue with that. But I am not a fan of flying, devoted or otherwise. However the mere fact that I can board a jet here in Oregon and arrive in Arizona less than four hours later was in itself a bit of a Traveler’s Rush, just realizing how big my world could become with flying. Arizona for instance; had I made a road trip it would have meant 17 plus hours drive time. I couldn’t do it straight through and be in decent shape on my arrival. Driving would also have cut into and shortened the time with my family. I find road trips not anything like plane trips, especially when I want to be the one sitting behind the controls. I’m stingy about giving up control when it comes to transportation. Traveling down an open highway with the music volume cranked up so high the steering wheel vibrates in my hands. The kind of Travel Bliss that I know well. Yep, road trips are something I love to do. Airplanes and I have mutual respect for one another and our respective positions. I agree to appear the picture of calm during take-offs and landings while in truth I am white knuckling it. In return the airplane agrees (yes I am being a bit anthropomorphic here) to keep the turbulence at a minimum and all children flying on the same flight little cherubs of delight, saving their meltdowns for the car ride to Grandma’s. A recent trip flying to Scottsdale Arizona was an adventure from the very beginning. Although I have flown in the past, it’s only been as far east from my home state of Oregon to Colorado. As far south as California. This trip also included a road trip times two with my daughter Janis: Road Trip one -My daughter was my personal shuttle getting me the 2.5 hours drive across the mountains to Eugene where my direct flight to Mesa AZ. Road Trip two-my daughter picking me up on my return trip and more time with family in Eugene. Road Trip one & two added the best kind of ‘bookends’ to my trip. As soon as I learned I was flying out of and into Eugene instead of on the High Desert I knew this happily meant a road trip with my daughter Janis and time with my granddaughter and the love of her life who I’ve come to adore; AND the road trips times two also meant an even more significance; the sweetest cherub child I’ve ever known…. my great-granddaughter – I may sound bias here but my assessment comes from having two beautiful daughters of my own and from my beautifully striking daughters came my beautiful granddaughter and my handsome grandson. On my return home to Oregon we made up for the too short visit prior to my Arizona trip by spending the night with my granddaughter and her beautifully loving family. Our beautiful new addition to our family. Baby N is a tenacious young lady already whose personality is as transparent as her very generous smiles. She’s a happily content little one who is so smart you can see the wheels of her intellect turning in her eyes with curiosity for learning how to navigate life. She’s almost walking at 9 months. My first choice was to NOT go. As much as I wanted to be with family in Arizona I would have to settle for the hope that some day a road trip would be in my future, and passively I would wait. Fear can be a strong motivator. The other choice could be to encourage my Gypsy soul, to engage my fear and to embrace flying alone…..and furthermore without medicating for anxiety. I’d not want to be numbed down for any part of the trip.I’d live in the moment of my experiencee. With option #2 my choice I felt a rush wash over me as soon as I decided. At least I wanted to think of it as a rush in lieu of anxiety. or fear. Anticipating the anxiety I’d always felt so keenly before on prior flights I planned again on applying my coping tool: The “tent my face” maneuver: i.e. covering my face with a sweater on take-offs and landings, but this time without anxiety medication. Somehow when I flew the first couple of time in the early 80’s I had convinced myself that my tenting my face trick was less embarrassing than the fear driven anxiety written all over my face. Maybe it’s a courage thing, or maybe the “*I don’t have forever to live so do it now”- but whatever it is I am making it my mindset today. Summing it up: Firstly embarrassment requires people, for instance a plane full of passengers and airline staff. Secondly, the passengers and airline attendants would need to be focused on me and simultaneously they’d need to be focused enough to read my reactions.Thirdly the world needs to revolve around me. Right? Sheesh…Oh for the love of the Universe, how ridiculous my thinking was during another time of my life. As the days drew closer to my departure I was noticing a curiously unexpected thing begin to happen inside my brain. What before had been anticipation of fear before a flight was now mysteriously turning into anticipation of courage, driven by excitement. Excitement and a sense of challenges that come about when creating new adventures, they inspire one to look even closer for even more exciting challenges. This trip from Eugene Oregon to Mesa Arizona was far different; I sensed it right away. I was also enjoying it-that was a first. And then it happened: the take-off – and my virgin first flight alone was my first experience with feeling the expansive Travelers Rush from flying. As the Allegiant MD 80 accelerated speed for take-off the awareness of feeling and being airborne was not something I had ever felt before when flying! As I said before: I wasn’t relying on anti-anxiety medication for flying but I did depend on and used a routine breathing technique to remind myself to breathe when anxiety hits me it’s physically crushing that I feel like I forget to breath, when I realize I’m holding my breath this triggers hyperventilation. The exercise works well and works fast. Deeply and slowly Inhale count to four, holding breath count to three, exhaling with count to four. I’ve used this exercise for more than 45 years, used it in natural child-birth with my daughters and later taught it to my daughters so they could quiet their minds to fall asleep. Yet I was still unprepared and surprised by how quickly my deep and slow exhale of 4 counts morphed into a giggle as my lungs deflated. Looking around the room for the culprit I realize I’m the only one on the plane who even heard it. Everything about that moment was inspired by the Traveler’s Rush that flooded through me. Finding words to express my feelings about my Arizona adventure wouldn’t come to me until almost a month later. All the emotions regarding my trip flooded my brain, touched my heart, and left me wordless. I was okay with that, knowing they’d come when they were ready. My flight/trip was a gift from two extremely generous and loving people in my life, the gifts of this trip I have received are now lifetime treasured memories. My hosts who’s very thoughtfulness in making sure my flight details ensured I would experience the full extent of traveling by air. I humbly appreciate and feel much love even today, almost 4 weeks later .Knowing that this was to be my first solo flight and that I had not flown enough to know what seat preferences mean to a flyer they booked me in a window seat one way, and an aisle seat on the return flight- they said, “try both, see which you prefer” I see the benefit and perks of both the window and aisle seats now, I also am fully aware that I’d not like the middle seat. Arriving after 8pm in Mesa it was dark and difficult to see from the air..The vast difference between Arizona’s High Desert and Oregon’s and once outside and walking to the car I first noticed the ambient air temperature and humidity difference. An extra bonus was not smelling Juniper and Ponderosa’s. My seasonal Juniper allergy was able to take an allergy medication vacation while in Arizona which was an unexpected bonus. My hosts were so extremely generous in making certain we had the amazing gift of quality time together.They left me to not want for anything, I felt like royalty by everyone in the house.Their lovely home that I felt an immediate comfort in while being able to spend some time getting to know everyone again. Memories that will forever be etched into not just my mind, but my heart as well. The days in Scottsdale were mellow and relaxing. Outside of spending time with my hosts I had two events I wanted to try to make happen while there. Again my generous hosts made them both happen for me. The Universe has a way of making a huge world shrink sometimes just to remind us that we are mere specks, sometimes those mere specks might meet one another and ignite memories that somehow will magnify the joy of meeting. Wednesday was my last full day and evening in Scottsdale. I was blown away by the abundant joy I was experiencing and the last day and evening alone made the trip uniquely memorable. My hosts generosity humbles me, I was treated to a full body massage first thing in the morning on that last full day. Following the massage we had lunch out and then spent the afternoon browsing (only a small fraction) of the museum’s exhibits…but we saw the Stradivarius exhibit! It was a moment in time that felt like it stood still being in the same room with such beautifully crafted violins from centuries before. It will take several more afternoons to take in the entire museum. 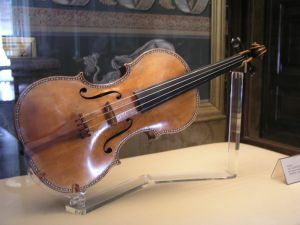 The Stradivarius exhibit was on loan to the museum for only a brief exclusive time and I feel especially fortunate that it was on exhibit while I was there. We also took in the exhibits dedicated to the United States and Canada music instruments, but again more time is needed as the museum has exhibits of music instruments from all over the world. I will go back, and again and again. I mentioned before how in this massive universe we are sometimes sparked by one another shrinking our world. A special kind of spark happened a few months prior to booking my trip – when my hosts and I realized that we have a favorite musician in common who also happens to live and performs in Arizona. I became an immediate fan four years ago when I first heard *Eric Ramsey’s music. Right away I was captivated and soon I was playing his music on the Barefoot Rock n Blues radio show. We became and have been cyber friends for four years but had ever met. Again my generous hosts who also happen to be friends with Eric and often see his live performances arranged for him and I to meet finally. Another highlight. Along with meeting and having a drink with Eric our evening included some mega Scottsdale/Phoenix music talent. A little bedroom community called Carefree (don’t you know I could live there? ) includes a beautiful laid back cafe called Janey’s which I had serendipitously known about since being introduced to Eric’s music. Eric often performs at Janey’s along with other artists which I often am able to catch on YouTube. The music on this particular night was fabulous, I’ve heard that it’s always a full house on Wednesday evenings The vibe of the folks listening in and gathered around the stage felt like home. While the performers all had massive stage presence the stage has its own impressive presence as it’s backed by one of the largest cactus I’ve seen that close. Yes, very much another highlight the evening was. I met several musicians who thanks to social media we are able to connect post my trip. Not too different from back in the days of becoming pen-pals with some met on vacations. .
Arizona is beautiful, I loved every aspect from spotting different creatures there such as the Roadrunner I saw (so cool!) and little reptiles along with the enormous and beautiful indigenous cacti that were just beginning to bloom – My entire experience touched every cell of who I am. I’ll leave off with thanking my hosts, thanking Eric for taking the time so we could meet, I’m thanking the music maker’s and folks of Arizona for making me feel welcome. I will be back. .I also am leaving off with a video of one of *Eric’s live performance, a fine sample of Eric Ramsey’s music and his brilliant wordsmithing. This song is a magnificent representation of how Eric spins a story through song. Gypsy Soul seeking Traveler’s Rush- next stop- Tampa Florida – featuring St Pete’s Beach and Sarasota. Whew! You made it. I LOVE the Gulf coast of Florida and plan on going too. The flight is only 3 hours and the drive to the coast one that stirs nostalgia. Wish my husband shared my taste for tune blasting though 🙂 Thanks for putting yourself into this post. Lovely read. Thanks so much Les, I always appreciate your feedback. I wanted to say too that I like and am grateful that we are able to connect more often on FB. So see you on the flipside.